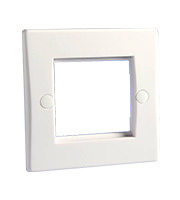 Get contemporary and stylish moulded white media plates & modules for less at Direct Trade Supplies. We carry the products used by professionals at low prices, so they are accessible to everyone. 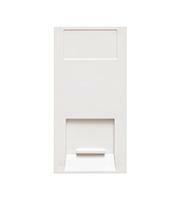 Sleek and modern-looking moulded white media plates & modules are easy to integrate into your building's décor. Electrical accessories are mandatory in every building, but they can also function as an attractive design feature as well. These simple plates and modules do just that, so you get the best of performance and practicality in one product. 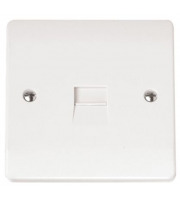 The televisions, computers, internet connection, sound systems and other media appliances in your establishment need to be wired up safely, and this is made easy with moulded white media plates & modules. 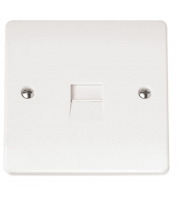 Square and rectangular plates give you plenty of options to pick something that fits your wiring needs. And you can be sure that no matter what you choose, all of the products that we carry meet European and British safety standards, and can be used in conjunction with common media elements found in commercial and industrial buildings. Link up individual media appliances or power full systems with the help of wall-mounted modules, all of which are simple to install thanks to the sleek mounting plates in a smooth white finish. In addition to finding the Moulded White Media Plates & Modules you need to wire up your media, you'll also be able to get the tools and supporting accessories for the job at Direct Trade Supplies. We pride ourselves on being a one-stop-shop for companies that need to outfit their buildings with the best electrical appliances possible. You don't have to waste time shopping around with different vendors, as we carry the best of them all in one place and at the lower prices. Better still, we offer additional discounts on large bulk orders. To learn more, call Direct Trade Supplies on 01752 261211.